How do you make sure you’re physically, emotionally and mentally ready to ride? Here’s how these Motorcycle Mojo Magazine’s FaceBook fans, handle it. Mark K. Don’t ride angry. William H. Just as you should have a check list to inspect your bike you should have a mental checklist to examine you mental and emotional state before you throw a leg over the bike ! Pam B. I’m pretty weak after languishing in the hospital last summer so I joined a gym and am trying to build up my strength so I can feel more solid and confident on my new Triumph. Kevin G. When the familiar ritual of getting ready to go riding seems to be taking way, way too long, then I reluctantly reach for the car keys. Darlene D. I always give the bike a good go over, make sure my gear in a good state of repair. I check over the route I am taking, make sure I have cash and my cellphone is charged. I also let people know my eta. I make sure I am well rested and in a good headspace. If I am tired or upset I don’t ride. Suhaymath N. Physically, I just generally try to make sure my endurance is decent enough. Strength is secondary. Emotionally and mentally (and contrary to all logic, especially regarding being in the right frame of mind to ride! ), I honestly have this constitution where I can jump on a bike in absolutely any mood and it has no effect on how I ride. Obviously, I try to be emotionally and mentally clear by default, but I feel lucky that it’s not a steadfast requirement for me. John T. always be happy and open to others, as they are the ones who usually make the ride most enjoyable, Always do a walk around before getting on the bike and occasionally close check for loose parts etc… Safety is first! Karen G. On a trip or a really long ride, I try to get lots of sleep, drink lots of water, eat a healthy breakfast. The emotional part seems to take care of itself as soon as I’m rolling. Malcolm K. Just thinking about going for a ride is enough to make me ready to ride! That and being stone cold sober are all I need. Tim M. Never in shape, always wanting to ride, remember that I control what’s happening around me. 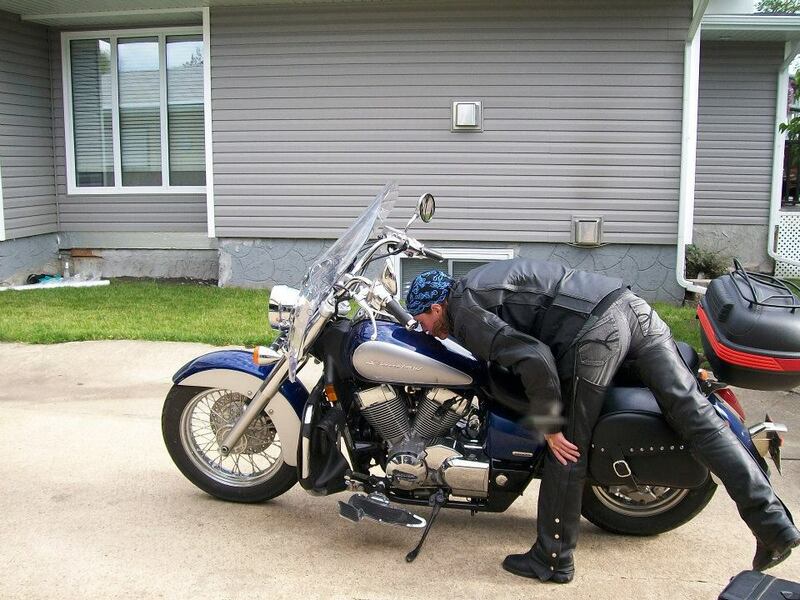 Bruce A. full tank, wallet in pocket with insurance, walked around tightening if necessary, check air pressure, turn signals, brake lite…ride baby, ride!! What do you do to make sure you’re ready to ride?